Egypt to Provide Protection Forces to South Sudan for the first time. 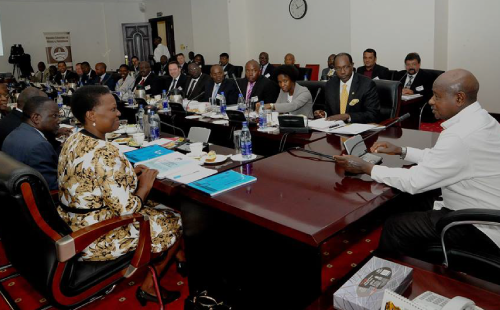 President Yoweri Museveni speaking before the members of Uganda Chamber of Mines and Petroleum at the retreat at State House Entebbe recently. The Bieh Telegraph)—-President Yoweri Kaguta Museveni has welcomed Egypt’s decision to provide a protection force in South Sudan citing that Egypt, unlike Uganda, does not share close border ties with South Sudan and would, therefore, not be accused of bias in the situation. He called upon the Egyptian government to discourage the United Nations Security Council’s policy of putting sanctions on South Sudan saying that sanctions cause a vacuum in the leadership. President Museveni, was speaking at Entebbe State House where he held bilateral talks with the Egyptian leader President Museveni urged the government of Egypt to resist sectarianism, which he said is responsible for the rise of extremism in the world. “When President Mohammad Morsi came here, I told him his project of Muslim Brotherhood was dangerous for Egypt. In Uganda, we do not look at religion and tribe but citizenship,” he said. Regarding the River Nile, President Museveni said that the government of Uganda would take strict measures to ensure the conservation of River Nile so that Egypt, which relies on it solely for water supply, would not be affected. “The problem of the Nile is too much agriculture. The Chinese brought the culture of growing paddy rice in the wetlands which wetlands need to be left alone and used sustainably,” he said. He added that the Nile Basin countries should also develop a highway along the Nile, in order to enable land locked countries like Uganda, South Sudan and Ethiopia, to reduce the distance to Europe and to the Port of Alexandria. Turning to investments, President Museveni thanked the Egyptian government for sending its private sector players to invest in Uganda and promised to support them. He encouraged Egyptian investors to build warehouses so that Egyptian products do not only appear on the Ugandan market during the trade fairs only. President Abdel Fattah el-Sisi on his part commended President Yoweri Museveni for his role in bringing peace to Uganda and the African continent as a whole. President el Sisi who had earlier in the day jetted in Uganda and received by his host at Entebbe International Airport, noted that there was need to address regional challenges such as terrorism and extremism which he said threaten the stability of East Africa, North Africa and Africa as a continent. “Terrorism is threatening the sovereignty of countries. We need to stop the plague of extremism and make sure it does not have a negative impact on our development,” he stressed. On the issue of ensuring stability in Africa, President Sisi said that Egypt supports the work of the transitional government of South Sudan and would desire to be part of the regional protection force. President Sisi also called for increased trade between Uganda and Egypt. A joint Permanent Commission is slated to meet and see how to boost trade between Uganda and Egypt. President el Sisi said his government would collaborate with Uganda in many sectors including irrigation, livestock framing and electricity among others. During President Sisi’s visit, a memorandum of understanding on political consultations between the two was signed. Before the Egyptian President concluding his visit to Uganda, he was hosted to a luncheon by President Museveni at State House, Entebbe. President Museveni saw off the Egyptian leader at Entebbe International Airport. Dr. [Khartoum] Dr. Riek Machar, the chairman and commander –in- chief of the Sudan People Liberation Movement/Army [IO] appoints the following comrades with the effect on 1st Dec, 2016. Pursuant to the SPLM [IO] constitution and reference to the Political Bureau resolution of September 23rd, 2016 on restructuring of the SPLM/SPLA [IO] political organs, I, Dr. Riek Machar Teny Dhurgon the Chairman and C-In-Chief, of the SPLM/SPLA[IO] appoints those comrades to save our movement.